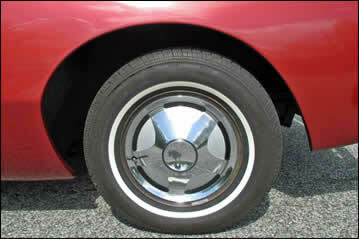 Stamped steel, five-lug wheels were standard, measuring 15 x 5 inches and furnished with decorative five-spoke wheel covers. The spaces between the spokes form five contrasting parabolic arcs that expand to the wheel rim. Standard tires were blackwall 6.70 x 15 bias-ply, although optional tires included whitewall, whitewall Nylon 500 and blackwall Nylon 500 bias plies, all in the same 6.70-inch dimension. Today it is not unusual to find an Avanti with aftermarket equipment, such as mag or wire wheels, or radial tires. 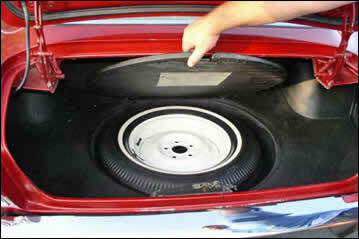 A spare tire fits into a wheel well located under the carpeted trunk floor. Raymond Loewy described the aerodynamic shapes of his Avanti wheel openings as spacecraft "re-entry curves." 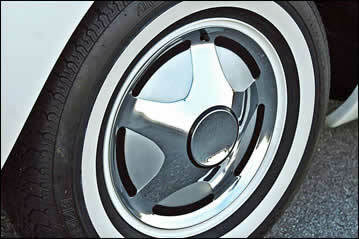 Studebaker Avanti stock wheel covers. 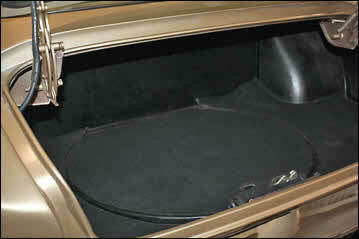 Trunk opened to show location of hidden wheel well. Avanti wheel and tire inside the "re-entry curve" wheel opening. Trunk open showing wheel well with spare tire. Photo courtesy Classic Car Repair & Restoration.